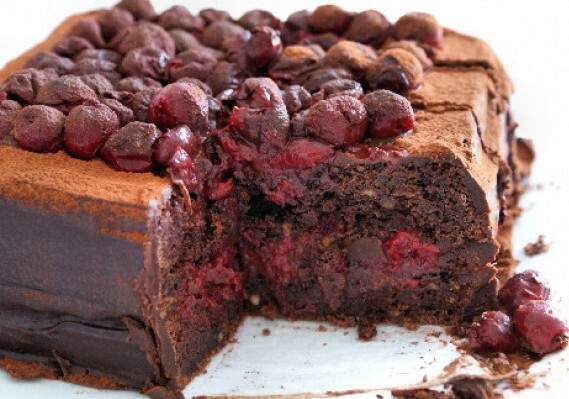 Intensify Your Taste Buds With This Intense Cherry Chocolate Cake! When I first made this cake I absolutely loved it. However, when I made this cake for the second time I decided to add some extra fruit. Now I did not add the extra fruit inside of the cake, but I garnished it on the top. I added some raspberries and strawberries. The chocolate ganache is so delectable! This is the kind of cake that my kids like to keep around in case I get a little cranky. They know that this cake will make me feel 100 times better! Every now and then we need a little sweet treat to make ourselves just feel good. Well, this is the cake that will do it! Try it for yourselves and you will see! This is one cake that I will make more than once! The taste is out of this world! Chocolate and heavy cream for the ganache (equal parts of each). Preheat oven to 350 degrees. Melt the chocolate & butter together, set aside until it cools down a bit. In a bowl beat the sugar and eggs until mixture whitens, then add the melted chocolate/butter. Add the flour, baking powder and salt- mix well until smooth. Transfer batter to cake mold (fill 3/4 up) lined with parchment paper and bake for 25 mins (check with a sharp knife and extend time by 10 mins if needed). Remove from oven, let cool and place cake in freezer for 1 hour- this is to allow easier slicing for later step. Prepare ganache: in a pot, heat the liquid but do not let it burn. Remove from heat, throw in the chocolate, cover with lid for 5 mins. Remove lid and stir until smooth and silky. Slice cake in half horizontally. On the bottom half, poke layer with a fork and brush over the liquidy cherry jam. Follow with a layer of the ganache and then some cherries. Cover bottom half with the top half, and coat entire cake with chocolate ganache. If you have leftover cherries, use some on top for decoration and optionally you can dust it all with cocoa. Place in fridge for a few hours until set and then enjoy! Quick Tip: Chill in the freezer for an icy taste! Thanks again to The Answer Is Cake for this amazing recipe.